71. Hurrumph, or How I became a Grumpy Old Git. | Things I Wasted Too Much Time On. I don’t know why I started to think about this today, but wishing for things, or wanting things that you never get seemed to pop into my head. Theres been a lot of things I’ve wanted and never gotten. But as you get older these things get less, though more focused on certain things. Lets say a retirement to a nice secluded beach for instance. When you are younger though you want everything. EVERYTHING I TELLS YA! And with every commercial that came on during children’s T.V. or every home shopping catalogue my want list would be more. Though I’m sure if I got everything I wanted then I would not have been happy. 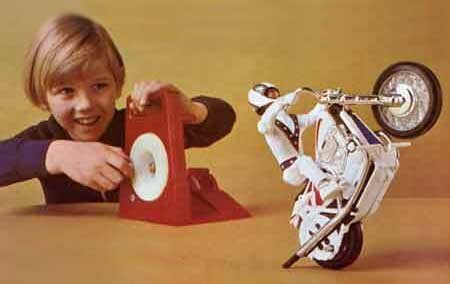 I would have however a whole load of great 70s toys that I could sell on EBay for a nice profit. 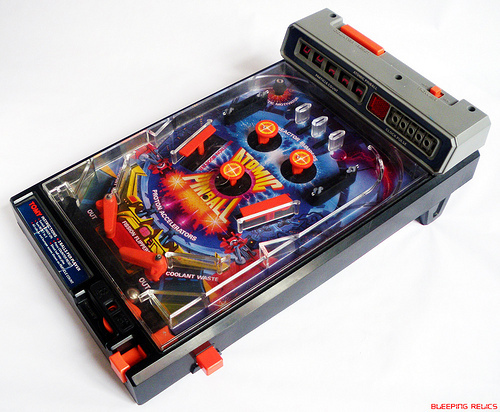 One of the things I wanted was a pinball machine that was being advertised by F.W.Woolworth. I remember at the time almost being sick wanting this damn toy. It looked so damn cool on T.V. with its electric lighted score counter. I would have been fantastic to have that in my bedroom. It would be like having an arcade all to myself and not have to put a quarter in the slot. Hmm. I’m sure the fun factor would have been very limited. and I’d have scratched up the plastic, or broken bits off it. It as you can see is made of a sturdy material that is made to last. I think it was for the best that I didn’t get this. Don’t knock the table, Damn! I did however have Domino Rally. A great little game, you set up the dominos and knock them down. It normally took several attempts to set them up right, and then about two seconds to knock them all down. Now the reason they never stood up right properly I never understood until I worked in plastics, shame on you Domino Rally employees for not cutting your gates properly. And the reason it took about two seconds to knock down was you had about a handful of dominos to use for your “course.” This was an evil plot from the company for you to buy the expansions packs and add-on products that I never got. X-wings, Tie Fighters, I loved my Star Wars Stuff. I had a nice little collection. And when the movies came out the commercials for the toys were awesome. O.K. I just went back and looked on YouTube and the commercials I found weren’t that great. Downright creepy to be honest. So I added the commercials below so you can make your own mind up. My point was going to be this. On the cover of the box (or in the commercials as my memory thought) the play sets were awesome. 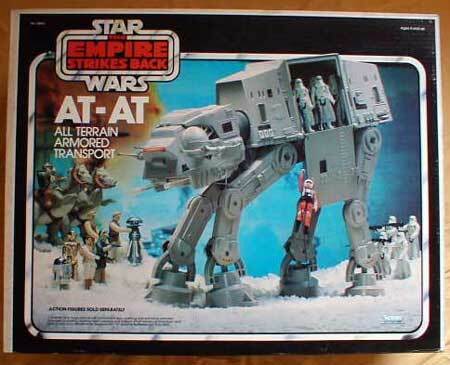 Look at the AT-AT in the snow setting with all those characters (each sold separately). My rebel army could have kicked the empire in one episode! because I had three storm troopers. I wanted to own everything that was made by Kenner. I guess that’s down to a great set of movies and some fantastic advertising by Kenner. Now in 2012 I just wish I owned the toys, in the boxes! I could retire a rich man! Did you hear about Mustapha Knevil? He tried to jump 16 nuns in a steam roller! Two action figures I never had were the Six Million Dollar man and the Evil Knevil figure. (just so you know I had to resist mightily from using the word DOLL.) My friends had them. So I got to play with them. The Steve Austin figure was cool with the roll up skin and the bionic eye. But really what did it do? Not a lot. In fact I think it’s a prime candidate for being dragged behind a school bus as in Napoleon Dynamite. The Evil Knevil doll (damn, I did it) came with a bike so it had promise. Though again I didn’t have one. I’d see my friends winding the handle for all they were worth and see the bike zoom off and fall over. I’m sure if I had one I could have got it to fly up a ramp and jump 16 hot wheels cars. But I never got the chance. I did however get to use my friends one to annoy their family dog! I’d also like to know why one of my favorite games never turned into the Olympic sport that it should have been. Again T.V. lied to me. I never got to play Connect Four in a stadium like on T.V. I’d have been awesome at it! I could have got a gold for England. Hmm. Now there’s an idea, a board game Olympics! You heard it here first folks, I claim copyright! I am a person who has always had too much time on their hands, and instead of creating a masterpiece or taking on the world, I have spent my time on nothing important at all. This entry was posted in games and tagged and it alphabetizes them anyway so this rant wont make sense., bad jokes, cars, does anyone read these tags? 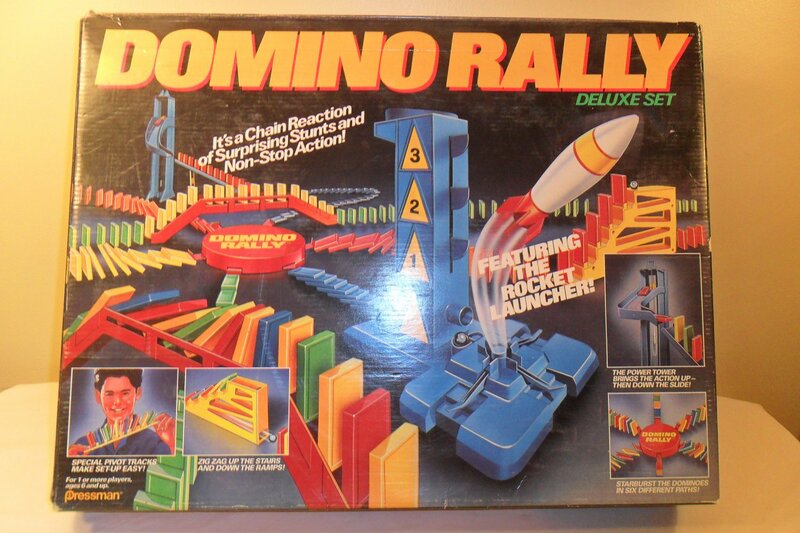 I don't thinks so, domino rally, domino rally action alley, entertainment, games, gaming, home made arcade, i'm bored and am looking up random crap, kenner toys. why did i not save all those toys as a kid, leave me a damn comment, secluded beach, the rocket always flew off and knocked the rest of the dominos over early, transportation, travel, vacation, woolworth. Bookmark the permalink. 4 Responses to 71. Hurrumph, or How I became a Grumpy Old Git. LOL I wondered if anyone did! I never understood that until this summer. Man I miss my air conditioning!